Dr Paul Frye is certified in Psychiatric Medicine by the American Board of Psychiatry & Neurology. Dr Frye practices in the Pittsburgh area of Pennsylvania (USA). He is developing this set of Internet information pages to spread the word about available treatments and knowledge regarding mental/psychological health. Click the wind-spinner image on left to proceed. Photograph by Paul E Frye - See copyright information below: The rights to all images, ideas and layout plus the implementing code are retained by Paul E Frye or the photographers/authors as credited. Disclaimer: The information available at this site is not intended to be medical treatment. One should always consult a physician for specific medical advice regarding their healthcare. Posting of the information provided on these web pages is NOT intended to create, and receipt of such information does NOT constitute, a physician-patient relationship. This site does not use "cookies" or collect any information about visitors. Any links to other websites are provided for the convenience of visitors to the site, and are not referrals to other physicians nor endorsements of those linked sites. 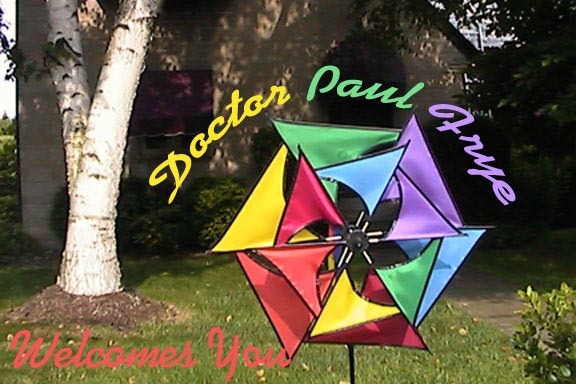 © Copyright 2004-2019 by Paul E Frye, MD. All rights reserved. You may reproduce materials available at this site for your own personal use and for non-commercial distribution. If you make an extensive copy of material contained in these pages, please include this copyright information.